All hands to the pumps as Structure Ten is given an extensive clean, ready for a major photo session. Thanks to the rain . . .
Today started with a plague of mayflies — those tiny white flies, which hatch out on the margins of Harray loch and which find their greatest satisfaction in settling, in blanket formation, on archaeologists. Luckily they don’t bite, which is the best thing we can say about them. The immensity of Structure Eight is revealed after its covers were removed prior to an overall clean, photo session and laser scan. Fortunately, they seem to have brought better weather with them and that certainly brought smiles to the faces of the Franco-German film crew living with us for most of the week. We can’t be sure but it seems possible that they discarded at least one layer of clothing as the temperature climbed. They had some catching-up to do because of the bad weather at the beginning of the week, so they spent some time filming site director Nick in Structure Twelve, while he described its various glories. 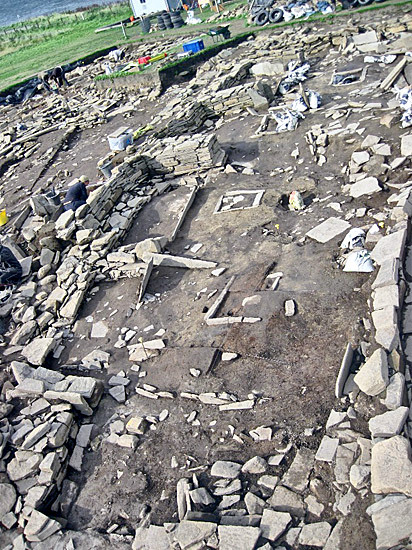 Then they moved to Structure One, where they were shown some of our very best artefacts (thanks, Stromness Museum, where there is an excellent Ness exhibition at the moment). They also brought along a drone, which buzzed happily over the site for much of the afternoon taking photographs. Presumably these little creatures have gimbals because it is quite astonishing how stable they appear, even in strong Orkney winds. 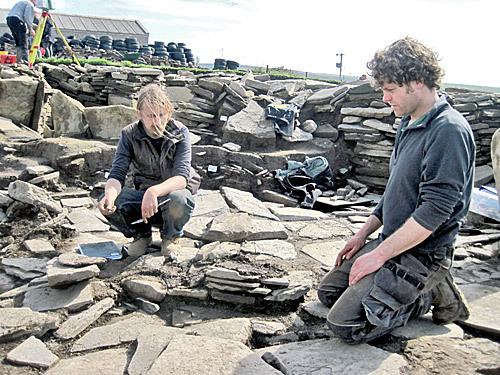 Owain and Dan unravel the complexities of the paving and wall lines around the central standing stone. Much of the afternoon was taken up filming Dr Ingrid Mainland in one of the house labs, where she told them all about the fascinating bone assemblage from the Ness. Excitement on the rest of the site was more muted than the previous day, but it was certainly a busy place throughout the afternoon. A massive clean-up of Structure Ten was mounted in preparation for photography and laser scanning. This revealed that the rain earlier in the week had actually been of benefit because it had cleaned, and therefore revealed, many more examples of coloured sandstone in parts of the walls. Some of these are very large blocks and look really lovely, yet they seem to have been largely hidden within the wall lines. Nick speculates that they may have been examples discarded by the builders, which implies that there are even more magnificent blocks elsewhere. But where? The freshly cleaned central chamber of Structure Ten. Note the massive threshold stone on the far side of the photo. In Structure Eight, the plastic covers were removed in preparation for an overall clean tomorrow. The recess to the south of the structure has now been clarified as one side of it seems filled with very large rubble. However, this is at a lower level than the Structure Eight floors. Alice and Andy reveal more of the south end recess of Structure Eight. What does this mean? It may point to a reuse of material relating to Structure Seventeen, which underlies Structure Eight. Owain has moved all of a metre back into the paved area around the central standing stone and is now removing some ephemeral stone. 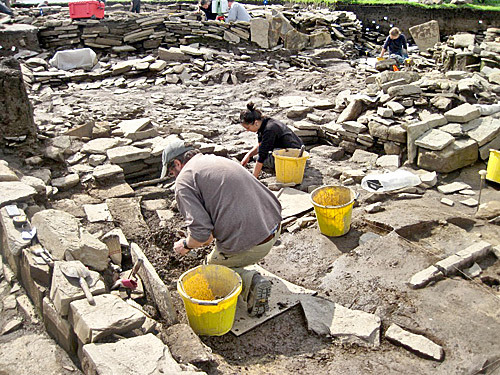 Some of the slight walls in this area may be revetment walls, designed to hold back, or define, dumps of midden, however, the situation is complicated by the appearance of more wall lines. Our distinguished visitor yesterday was Mr Wilf Weir, the Orkney Islands Council director of education, who was shown around by Professor Jane Downes and Orkney College principal Bill Ross. Mr Weir appeared to enjoy himself and we are delighted to have someone in his position appreciate the tremendous educational benefits which the Ness brings to Orkney, as well as the very obvious economic benefits from the mass tourism which we have engendered. The weather has been so variable this summer that we will just wait for tomorrow to see what it brings us.